Statues of Adhiparasakthi are used for worship in temples dedicated to Her. Only temples may install a statue and each temple must be built by a Sakthi Peetam. The statue of Supreme Goddess Adhiparasakthi in the Siddhar Peetam Temple in Melmaruvathur can be seen at the right. During the ceremony kumkum powder and flowers are offered to the Goddess as the mantras are chanted. These rites are called agama rites. 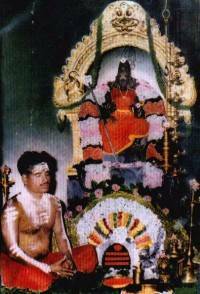 As the Om Sakthi Movement expanded, devotees wanted a way to worship Adhiparasakthi without having to travel to the Temple in Melmaruvathur. 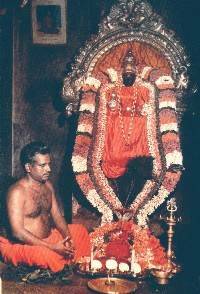 Through Her oracle Adhiparasakthi said that Adigalar should sit beside Her statue for a picture. This picture could then be installed in a proper place in their homes and used by the devotees for worship. The first picture for this purpose and the picture currently in use are shown below. 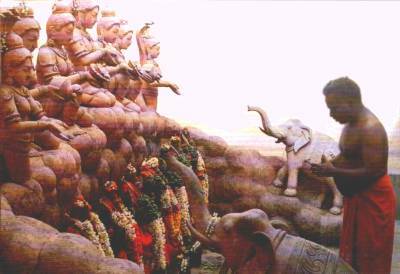 The Siddhar Peetam in Melmaruvathur also has statues of the seven goddesses. These statues can be seen in the picture below which shows our Guru praying before them.